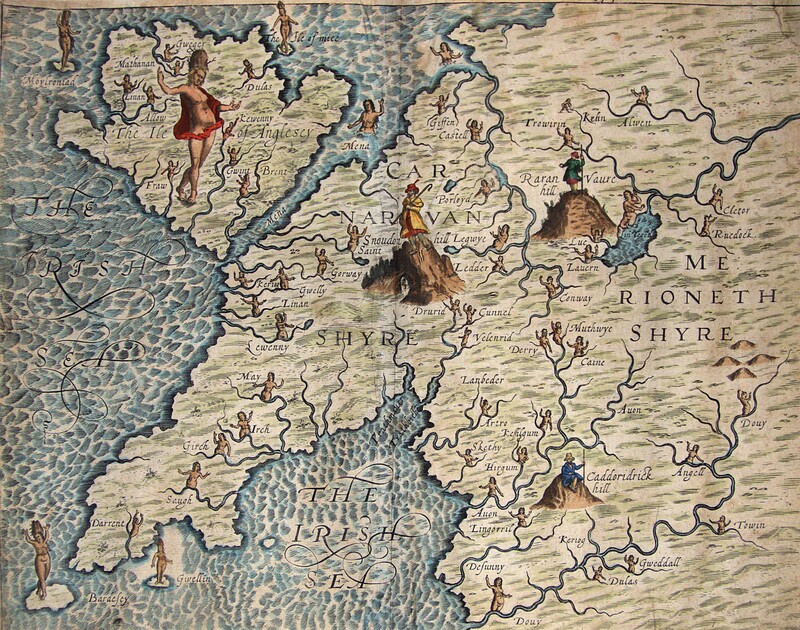 My interests in Anglesey extend to old maps of the island. On this page I give some information about the maps I have in my collection. If you find yourself interested in these old maps, you may want to buy one of your own. I have several 19th century maps for sale; click on the image to the right to view them. To learn more about old maps have a look at the on-line edition of Antique Maps, by Carl Moreland & David Bannister. 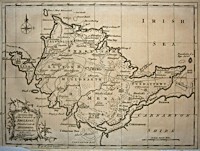 There is also an interesting guide to collecting antique maps of Britain and Ireland. An excellent discussion of old maps, with an extensive section of the lives and works of dozens of British mapmakers, can be found in David Smith's book Antique Maps of the British Isles. Looking for modern maps of Anglesey? Try here. In 1579 Christopher Saxton published his Atlas of England and Wales, the first complete collection of county maps of the kingdom and one of the first national atlases ever produced. These maps were later reengraved by two Dutch engravers, William Kip and William Hole, for publication in William Camden's Britannia. The map reproduced here is from the 1637 edition, which has larger format maps than the earlier 1607 edition. 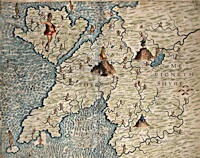 Saxton's original map had both Anglesey and Caernarfonshire together; Kip and Hole split them into two maps. John Speed, the son of a tailor and a tailor himself much of his life, produced an ambitious history and atlas of Britain in the early 1600's, under the patronage of Queen Elizabeth I. His maps were notable not only for their accuracy but also for the town plans included on many of the county maps. The maps, first published in 1610-11, were hugely popular and were republished many times over the subsequent century. 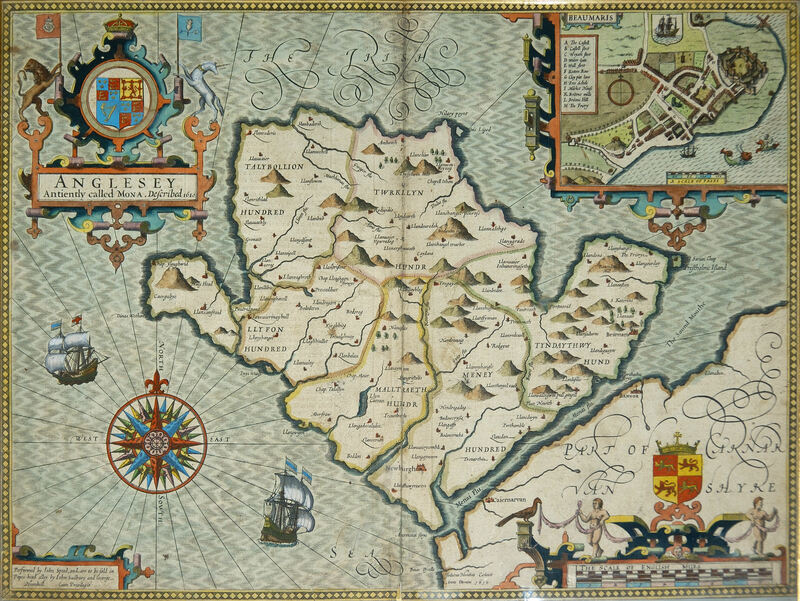 The Anglesey map includes a town plan of Beaumaris. And her proud Mountaines highly chaunts. The wonders of their Pimblemere. With Cambria’s native Princes deeds. And manner of their Sacrifice. Then back for Flint and Denbigh falls. These maps were engraved by William Hole, who also worked on the Speed map above. An excellent site about the Poly-Olbion can be found at Exeter University's Poly-Olbion project. In 1595 Gerard Mercator, the mapmaker who coined the term "atlas" and gave his name to the Mercator projection, published a collection of maps of areas of the British Isles as part of his Atlas of the World. 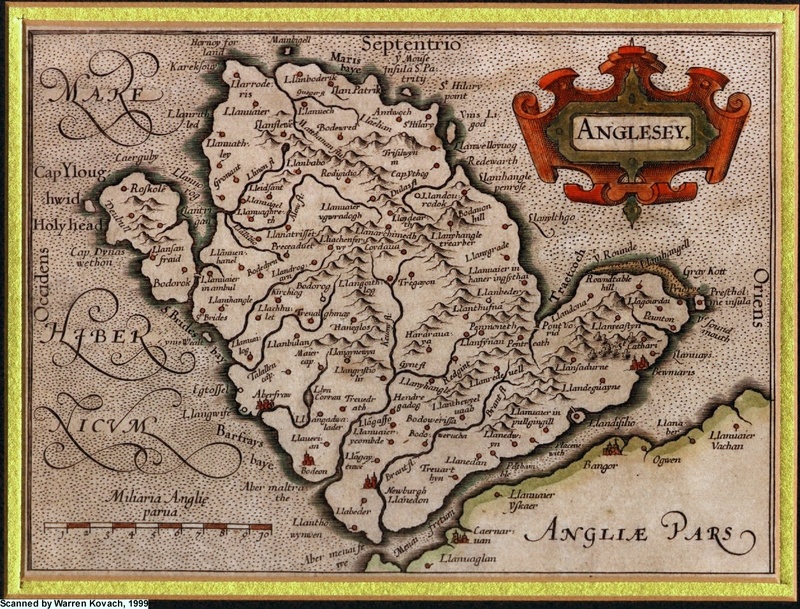 This Anglesey map comes from a later edition, published around 1619 (perhaps by Jodocus Hondius). This map is taken from the book Britannia, published in 1675 by John Ogilby, the "Cosmographer to the King". 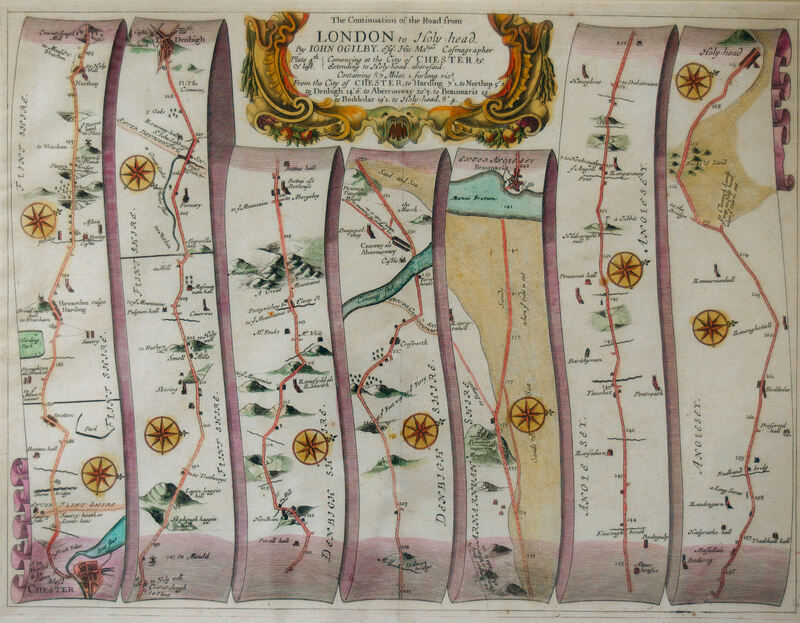 It contained maps and descriptions of the main routes throughout Britain, presented in the form of ribbons showing the road and nearby landmarks. This map, part of the London to Holyhead route, shows the section from Chester to Holyhead. The route takes the traveller to Anglesey by crossing the Lavan Sands at low tide from Penmaenmawr on the Welsh mainland to a ferry across the strait to Beaumaris. 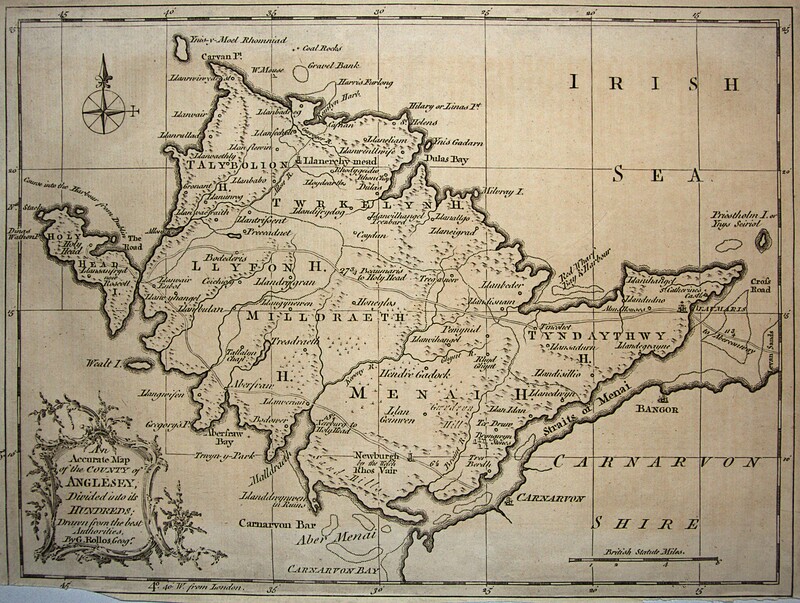 This map, engraved by Emanuel Bowen, was published in 1720 in John Owen's Britannia Depicta or Ogilby Improved. This was a road atlas of England and Wales produced at pocket-size to be convenient to carry for travellers. 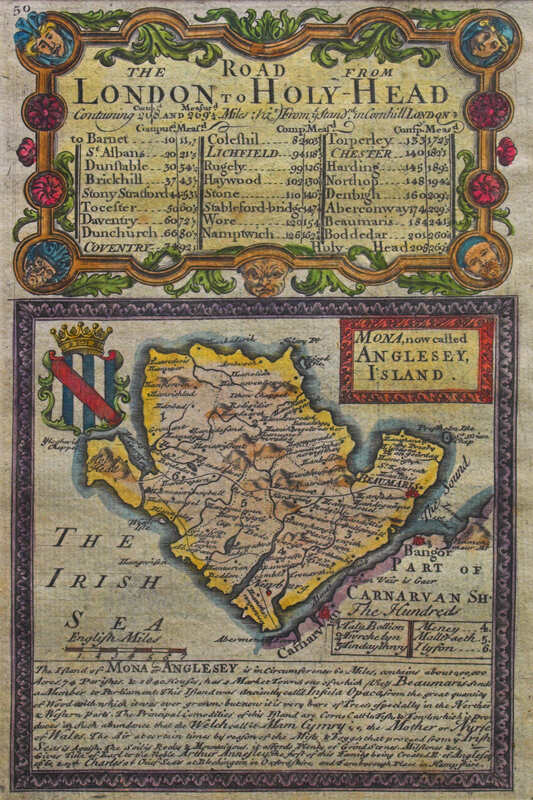 The book contains county maps such as this Anglesey one, followed by a series of strip maps showing the main routes (see some examples here). These were based on the maps of Ogilby, such as the one above. 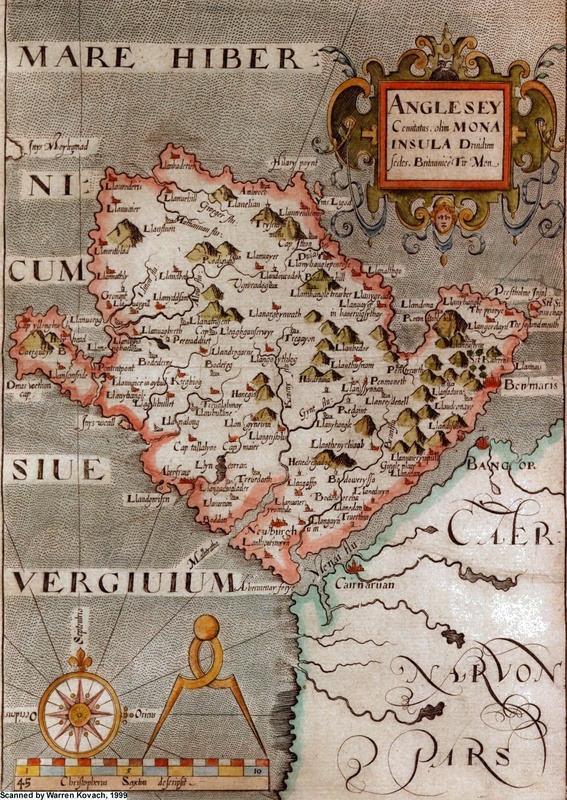 The text below the map reads: "The Island of MONA or ANGLESEY is in circumference 60 Miles, contains about 200,000 Acres, 74 Parishes & 1840 Houses, has 2 Market Towns, one of which (viz.) Beaumaris sends a Member to Parliament. This Island was anciently called Insula Opaca, from the great quantity of Wood with which it was over grown, but now it is very bare of trees especially in ye Northern & Western parts. The Principal Comodities of this Island are Corn, Cattle, Fish & Fowl, which it produces in such abundance that the Welsh call it Mam Cymru, i.e. the Mother or Nurse of Wales. The Air at certain times by reason of the Mists and Foggs that proceed from ye Irish Sea is Aguish. The Soil is Rocky and Mountainous, it affords plenty of Grind Stones, Milstones, &c."
Entitled "An Accurate Map of the County of Anglesey", this one seems to be anything but. Compared to the above, earlier maps, and modern maps, the outline is oddly distorted. Some later maps, particularly John Cary's map of North Wales in 1787, used this same inaccurate outline. This map was produced by George Rollos, an engraver who owned a map and print shop in Long Acre, Covent Garden, London. It is one of five maps he contributed to the book "England Displayed. Being a New, Complete, and Accurate Survey and Description of the Kingdom of England, and Principality of Wales." by P. Russell and Owen Price. See my page of maps for sale to see pictures and details of some later 19th century maps.